High performance spinning reels with all the features and functions needed for years of reliable service. 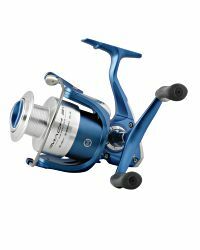 With 7 ball bearings, a sealed carbon-fibre drag system and stainless steel shafts and components these are good quality spinning reels. Great budget spinning reels. Lightweight graphite body, spool and handle create a strong and robust reel that won't unbalance even the lightest of setups. - A fully adjustable Rear Drag system. - Graphite Body, Spool and handle. - Supplied ready to go complete with mono line on the reel.